Lioness Professor Francisca George presenting gift to Lion Professor Kolawole Salako, Vice-Chancellor, FUNAAB on behalf of University of Nigeria (UNN) Alumni, FUNAAB Branch. The Alumni of the University of Nigeria, Nsukka also referred to as Lions and Lioness in the University have paid a Courtesy Call on the Vice-Chancellor, Professor Kolawole Salako and the Bursar, Mr. Chukwunwike Ezekpeazu who are also alumni. 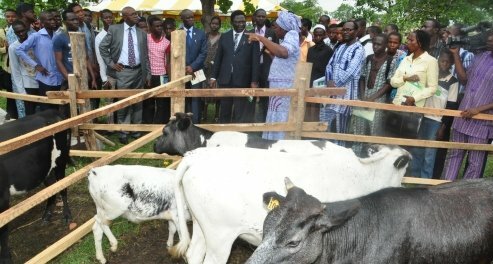 According to Professor David Agboola who spoke on behalf of the Alumni, the aim of the visit is to felicitate with the UNN Alumni on their appointment as the Sixth Substantive Vice- Chancellor and Bursar, respectively of the Federal University of Agriculture, Abeokuta, and to assure them of the prayers and support of the Alumni. Professor Agboola disclosed that the Alumni had watched with great admiration the successive progression of Professor Salako since joining the University till his appointment to the exalted office of the Vice- Chancellor. He enjoined him to always place God at the helm of all his affairs and seek God’s protection over himself, the University and its entire staff. In his response, Professor Salako thanked the Alumni for their good wishes and support, even as he pleaded for more support and prayers for the progress of the University. The Vice- Chancellor who noted that the progress of the University would require the commitment and dedication of every member of staff, cautioned that, “I won’t witch hunt anybody but I will not compromise on the issue of discipline and progress for the University. That is something that I can assure everybody”. According to him, “We are all going to work together and we are all going to make FUNAAB greater than what it is”.